If you're responsible for the property taxes for your business, it's critical to stay on top of when your jurisdiction is revaluing since assessment reductions achieved through a successful property tax appeal are not retroactive. This can be particularly challenging if you're charged with the property tax function of multiple properties across multiple counties. Your opportunity to maximize potential savings from an appeal depends upon filing a property tax appeal during a revaluation year. If you're responsible for property tax assessments of real property in any of these 9 counties, be on the lookout for revaluation notices, which should be mailed to the owner of record. While these notices could go out as early as December 2017, they're generally sent out in February or March of 2018. Overlooking a revaluation notice is the first of many potential pitfalls that businesses face. Once the notice is sent out, the company has a specific period of time, as stated on the notice, to appeal informally to the tax assessor's office. While you can potentially save more money during a revaluation year, an appeal may still be worth it during a non-revaluation year, especially if your county is on an eight-year schedule. Check out our article on determining whether a property tax appeal is worth the time and effort. If you've already received your property tax revaluation notice for your county, you may be considering an appeal. 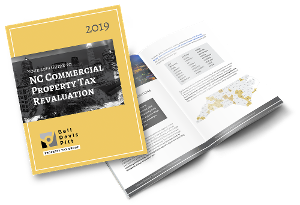 In our February article for the Winston-Salem Chamber of Commerce, we describe the key aspects of navigating the property tax appeal process including each step and how to determine your potential tax savings.